Yesterday was a big day. Not only was it the first day of rehearsal for Seattle Opera’s upcoming production of Lucia di Lammermoor, it was also my first first day of rehearsal. Yep, I’m new to the organization, having just joined the SO staff three weeks ago as Public Programs and Media Associate. And my first 20 days here at SO have all been building up to Lucia, so when I had a look at Monday’s busy schedule, I was excited to be a part of the production in any way I can – which, in my case, means staying informed so I can help get the word out about SO’s latest endeavor. 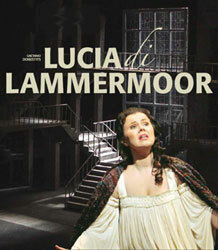 The day began with an hour-long design presentation for the artists and staff, where Director Tomer Zvulun, Costume Designer Deb Trout, and Set Designer Robert Dahlstrom explained their vision for this Lucia, which is set in the period of composition (mid-19th century) and features an adaptation of the multi-level set Dahlstrom created for I puritani in 2008. For more details on the set, read this recent chat with Dahlstrom, and come back to the blog tomorrow to read an interview with Trout that discusses her approach to Lucia’s costumes. After the presentation wrapped up, I had a chance to mingle with the singers at the casual Artist Aide buffet, organized by a group of volunteers who had spent the weekend shuttling to and from the airport, picking up singers as their flights arrived in Seattle. As we nibbled on lunch, baritone Ljubomir Puškarić, who along with Phil Cutlip plays the role of Enrico, chatted about his native Croatia, dispensing travel advice about the country’s many islands. Tenor Eric Neuville (Normanno) and I talked about his beautiful home state of Wisconsin. And tenor William Burden (Edgardo) complimented my hair, which is really all I need to be immediately endeared to a person. But soon it was down to business, and the Friday/Sunday cast headed into the rehearsal studio where they began singing through the score for conductor Bruno Cinquegrani, who is making his SO debut with Lucia. Also debuting with SO is the lovely Davinia Rodríguez, a soprano from the Canary Islands tackling the role of Lucia for the very first time. As I sat and listened to Rodríguez, tenor Scott Piper (Edgardo), Cutlip, mezzo-soprano Lindsey Anderson (Alisa), Neuville, tenor Andrew Stenson (Arturo), and bass Arthur Woodley (Raimondo), I got more and more excited for Lucia, which opens on October 16. And, OK, I’ll admit – a little envious, too. So much talent in one room! I definitely feel the urge to do something creative now, but maybe it’s best for everyone that I don’t attempt to sing.... I’ll leave that to these pros. Toi, toi, toi Tamara for your new work in keeping us "public" informed about what's going on at and with Seattle Opera. Hope you'll enjoy your new job!! !